High performance sailor Chris Draper is fortunate to have helmed for two America’s Cup teams in the past two years, sailing early on for Team Korea before being hired by Luna Rossa in 2012. Even though the Italian team were almost a year late into the game, Draper’s experience on the Extreme 40 series has helped his team maintain a fairly consistent place in the top half of the fleet in the AC World Series events, recently finishing second overall in the match racing event in Naples. The 35-year-old Brit is confident that his team is in a good place heading into San Francisco. How’s the pace been moving to a more established team? CD: We were very much part-time at Team Korea, and as soon as I started with Luna Rossa, it was full-time and full on into Auckland to start training where it was, well I would say 9-5 but it’s not 9-5, it’s more like 7-9 p.m. every day! It’s been fantastic ever since. Team Korea was an amazing opportunity for me, and it opened a fantastic door for me with Luna Rossa. I’ve been trying to make the best of it ever since. Obviously Team Korea didn’t have an AC72, although we had hoped they would build one. Luna Rossa has a boat, and everything came together for me to be the helmsman. It’s everything I’ve dreamed of--the fact that the boats went this direction and we’ve achieved really good results. We--the whole team--are really looking forward to giving it our all. What did you bring to Luna Rossa? CD: I’d like to think that my background has always been in high-speed boats: the 49er, the Extreme 40, and the classes I have excelled in have been that style of racing. Obviously the experience I had from the Extreme 40s and the very tight racing, and the experience I had from the ACWS in the early days--those skills really. It’s a case of also learning from the people in the team as well, add to those skills with the development of match-racing ability through working with Francesco Bruni and Iker Martinez. I’ve probably taken way more from the guys around me than I’ve brought to it myself, and I think that’s part of the America’s Cup. Luna Rossa didn’t fare well at the ACWS events in San Francisco last fall, but you got great results in Naples; what’s changed? CD: We’ve actually done really well in the rest of the ACWS events. We won in Naples, we were second in Venice in the match racing, we won in Newport, then we were second in San Francisco, then we had that really disappointing second event in San Franciso. We had changed a team member, which wasn’t a major, and I had broken my hand in the first San Francisco event, so we really didn’t do any sailing before that second SF event. We went into it super unprepared, and we had also been focusing very hard on getting the 72 ready while a lot of the other teams focused on sailing in SF in the 45. We went into that second event very weak, but that’s not to say we haven’t been working very hard as a team. We’ve been racing one another a lot in the 45s to improve our pre-start and match-racing skills, as well as alongside sailing the 72 and our SL 33, the testing platform, so we’ve been very busy in Auckland to say the least. We’d like to think we’re as strong as any team now on the racing skills, especially the match racing, which was an area where we’d shown signs of brilliance but also where we’d made some silly mistakes. How’s the communication on the team with a mix of nationalities? CD: It’s about 60% Italians on the boat, and the rest is made up of Brits, Australians, Spanish. We’re lucky that those guys speak way better English than we speak Italian. The language on the boat is English--it’s not a problem really. Francesco Bruni and I sailed five or six World Series events together, and he’ll be the tactician. We work awesomely together. So the comms hasn’t been an issue, the only issue is finding a comms system that’s good enough to deal with the wind noise! What’s your take on the level of your competition, the other helmsmen, at this point in the game? CD: They’re all pretty cocked, and that’s what you come to expect at this level. We think that everybody who sails all of the boats knows that they have to sail the best races that they can in order to do well. I think everybody feels that all the time. I think it’ll come down to who has the best package and who does the best business with it. I think we all have respect for one another mutally, and there are no idiots. They’ll all be incredible on the line. Is that exciting or overwhelming for you? CD: It’s exciting, that’s the reason we do it, the reason why we love sailing so much is to go and race as hard as possible. That means going racing against the best people as possible. Nathan, Dean, and Jimmy--that’s going to be incredible. I feel very proud to be on the start line against those guys. The work I’ve done to get myself there has been fantastic. It’ll be about who can put the best game together on the day. It’s going to be a lot of fun. How much time have you had on the 72, and how is it going? CD: I think we’ve sailed about 42 days, maybe a little more. I’ve done the marjority of those. We had a period where Franck Cammas very kindly worked with us a bit and helped us work the boat up in the very early days, then Iker Martinez and myself shared the helm for the first 15-18 days when we were making the decision on who would helm the boat. Since then I’ve steered every day, and it’s been great. Obviously we’ve been fairly cautious because we have just the one boat and one wing, and that’s always been the case for us. But we’ve got the second wing coming on line pretty soon, and now we’re in San Francisco. It’s a windy place, and we’ve got to get out there in the breeze. Do you think the time in NZ has prepared Luna Rossa well enough for the Challenger Series? CD: I hope so. We’ve had some incredible sailing days and a lot of days in the 17-22 knot range. We haven’t sailed that many days when it’s been over 23 just because it’s so frontal quite often in NZ, so you end up with periods of 30 knots or more on the days over that. We haven’t sailed in huge breeze, but we’ve sailed in plenty, and we’ll be looking to push that up over the next 6-7 weeks in the build up to the Round Robin. Will you line up with ETNZ in that build up? CD: I expect we’ll all be sailing around in and near one another. The Bay is pretty small, so it’ll be hard not to cross paths. I wouldn’t be surprised if you see some of the boats sailing together. It’s uncertain right now. You’ve just moved to SF; what is the team focusing on at present? CD: We started so late with the campaign--almost a year behind the Kiwis and Artemis and Oracle--so we’ve had to hold on a lot of our design decisions until very late. At the moment we’re making a bunch of modifications to the boat as a first real modification session we’ve had on the boat since we’ve launched it. We’ll be back in the water as soon as we can. What do you think you need to do from here on out to be at the top of your game come July 4? CD: Good question: trying to get as much sleep as possible, working as well as possible with the team. It’s going to be long days and hard work over the next 8-10 weeks, and I’ve just got to give it our absolute all, be there for everybody on the team and do the best job I can each day. If I focus on that I’m hopefully doing myself proud, and we’ll be in really good shape as a team. It’s been anything but plain sailing for the America’s Cup Event Authority, organizers of the 34th America’s Cup and San Francisco, the host city, but, if nothing else, San Franciscans will love AC34 for what it leaves behind. A full year of battle was fought to craft a deal that was agreeable to both sides yet behind closed doors, the niggling still carries on. But, it is the America’s Cup so nothing new and sadly, to be expected. As the Event has downsized to just three challengers, so have expectations, to the point where perhaps it’s a blessing that there are fewer competitors considering the radical change both organizationally and on the water that has occurred. Go small and do it right, I say. And for those locals who thought nothing good could ever come from the America’s Cup, a surprising amount of work has been accomplished in a very short time that will benefit the City for years to come. Kyri McClellan, CEO of the America’s Cup Organizing Committee, and Jane Sullivan, spokesperson for the America’s Cup at the City, fill us in on the legacy benefits that San Francisco will enjoy for years to come. How has the City made the most of the Cup coming to town? KM: From our perspective the city has done an amazing job on capitalizing on the America’s Cup and using it as a catalyst to accelerate some projects- anytime you want to get something done in San Francisco it takes a lot of time and there’s a lot of process. So, SF’s pipeline of projects along the waterfront was well stocked. They have used the America’s Cup as the hammer to drive a lot of things that have been planned for the waterfront for a long time. Chief among those are the passenger cruise ship terminal on Piers 27 and 29, something San Francisco has worked on for decades. If not for the America’s Cup it wouldn’t be here. That’s the preiminent example of San Francisco making the most of this. 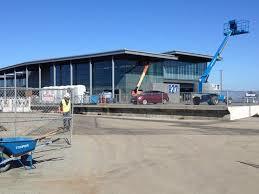 There’re also programs on the parklands to the south of the ferry building at Brannan Street wharf and also improvements to the Jefferson Street area to the north, at Pier 45 and the Marina Green. Describe some of the other programs that have been completed around the City. 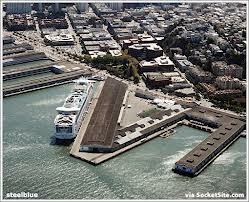 JS: Brannan St was a decrepit pier that was planned to be open space - Pier 36 as part of a Parks Bond. The schedule was accelerated and it’ll be great as its public open space looking at Piers 30-32 - some 2 ½ acres. Next door at Pier 38 the shed is being upgraded and 30-32 is also being upgraded taking a decrepit parking lot over the pier and making it a beautiful open space. To the north is the new Pier 43 promenade - a parking lot right along side the waterfront that was transformed into a promenade connecting Fishermans’s Wharf to the actual fishing wharf at Pier 45 - a lot of work has been done to the sea wall there which was very decrepit - it’s a huge improvement. The Jefferson Street public realm - the last couple of blocks of Jefferson Street at the Wharf which were kind of nasty has been made much more pedestrian friendly and “beautified”. People are basically coming to see a new waterfront - it’s extraordinary the differences. Additional improvements to the Marina Green and the harbors over there have been a long time coming and there’s been a hustle to make sure that gets done before the event including things like a new kayak launch and down at Pier 54 also for ‘human-powered’ boats. There are a bunch of new slips at West Harbor, and for people wanting to sail their boats over and tie up along the cityfront there’re new public docks. The other not so visible improvements include a couple of big sustainability initiatives. There’s new shore-side power down at Pier 70 so that when the shore-side power at the new Cruise Ship terminal comes back on, the capacity has been doubled for big ships coming into the Port of San Francisco so they can plug into shore-side power instead of running generators which is a huge reduction in air quality emissions. On the Marina Green which is an old park with systems running underneath the park, a bioswale is going in - an improved drainage system using natural materials. The key story is how quickly this has all taken place given how long some of these thing have taken. The Cruise Ship terminal has taken 25 years - this is the fourth time they’ve tried to do it. How did the improvements to Pier 30-32, where ETNZ & Luna Rossa are based, eventually transpire? 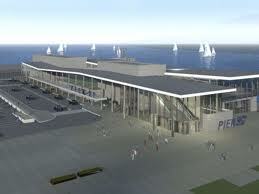 KM: The Port invested between $8-$10 million dollars in Piers 30-32, so that they could be used for the America’s Cup. When the real estate deal fell apart, the City stepped into the void because under the deal ACEA were going to invest $60-$70 million dollars so that the piers could be used for the Cup and then parlayed into something else. When it fell apart the City said they’d improve the piers so that they could still be used for the Cup (they could not have been used without improvements). They invested the money but it stayed a public asset and now it’s served as a catalyst as the possibility of being the new home for the Warriors. All the environmental review that was done and the physical improvements that were made for the Cup has made it viable for the Warriors deal. What has the City had to do in order to accommodate an Event of this magnitude? JS: This is such an unusual event - 50 days of sailing over 3 months with peaks and valleys in between - it’s a great test. The City’s created a special events team at MTA (Municipal Transportation Agency) which has changed the way MTA works with the rest of the City in supporting these events - they’re much more flexible, much more responsive to neighbor concerns. Some of the policy issues that people have wanted to introduce in the past have been put on this project for example, the prevailing wage issue is one - extending the regulations that the city has about public works projects into for the first time a temporary private event. Another positive outcome has been the OneSF: Celebrate the Cup program - part toward the fund-raising efforts and part as a civic engagement program. ACEA is out there marketing their event, which is great, but we want to market the City to the City - get local people interested. OneSF is more about San Francisco, not about the Event - it’s about getting people excited about that it’s happening here in the City. That’s also a legacy that could continue as we go after other large events for the city - help the City become a little more sophisticated in marketing itself. The City is going to be far better at handling these events after the America’s Cup. It hasn't been easy (LOL) but we’ve learned but only through these one-off big things do you effect this kind of structural change. The public transportation piece of this is also really key. There’s never been a great link between the visitor base and marketing and public transportation. We did a great job last October for the World Series - half the people on the Marina Green took public transportation not private vehicles - that’s huge. That’s also a big legacy for the city and the more people that use the system the more money there is for it and the better it gets. The City’s many small interest groups are often blamed for the lack of progress here - what’s your thoughts?KM: People here are really so passionate about their neighborhoods their community and the impacts - good and bad - you’ve had the business community and small business - very quickly support so many elements of the event because they directly benefit. I wouldn’t expect that the small interest groups to ever stop here - its engrained in who people in San Francisco are - we hold ourselves and our guests to the highest standard possible and all we ever try to do is raise the bar further. I’d never expect us to stop being aspirational - we don’t know how. We actually think its brought out the best in the city and the event as well. The biggest challenges all around? KM: Managing expectations - that applies to every single category of the players - managing the public’s expectations, what the size and scale is - and that’s because it’s continued to change, managing donors understanding of what resources are really going to be required because they also continued to change - it was this goal, then that goal. Managing the expectations of the Event Authority - what’s it going to take to get this done - on everyone’s part. JS: Timing - you talk about things taking a long time to get done in the city - you have regional agencies involved, federal agencies involved - just powering through all that - for ACEA to want to shift something 6-ft another way for the view may impact four different agencies permits. It seems absurd but that’s the world we live in. KM: All of those agencies have stakeholders but if not for those stakeholders and bureaucracies, our Bay would not be as pristine or available to hold the Cup. If it were not for Save the Bay and the work of those four lovely ladies decades ago, there would be no bay - it would be all filled in and there’d be no public viewing to watch the races. We owe a debt of gratitude and we have to pay that on a daily basis by living with the stakeholders who continue to be vigilant because the Bay almost wasn’t here. JS: Viewing from the shore is a game changer for the Event this time. Even the Event Authority people - many of them have been involved with previous America’s Cups have never done anything like this before - they were not setting up two main viewing areas where you can almost reach out and touch the boats. The learning curve has been steep all around. Has it been disappointing for the City to have the Event downsize to the degree it has? KM: With fewer teams participating making fewer demands on some of the public facilities, that means fewer costs. I think we agree that fewer teams means a little less interest and fewer spectators that would come for the bulk of the time. I think for our first time out of the gate on something like this, it’s allowed us to focus on the core objective for the city which was really how can we capitalize on the planning and preparation not just be successful with the Cup but look at the legacy benefits both from a community and infrastructure standpoint, but then also concentrate the resources on the events with the highest activity so really looking at September (Red Bull Youth America’s Cup and Defender Series), and the Louis Vuitton Cup finals. That’s going to keep our fundraising goal achievable and we’re also dealing with more specifics now that we’ve held two of these events already (World Series events here last fall). The police department had certain expectations for the crowd and crowd profile in the and while the crowds grew toward the end of the weekend, the police were able to back off their staff because they had a better understanding who the audience was - different profile, familes etc. If the Cup stays, what do you see for the future? KM: We have six months after the Cup to negotiate. There have been a lot of lessons learned in preparation and I think there would be a pretty comprehensive assessment - we’ve engaged the Bay Area Economic Institute who did the 2010 study - they did an update to their report which they presented recently which recast some of the economic impacts - how many teams, the footprint of the event re fewer people here for less time. That analysis will drive and inform the city’s offering. What is the expense to the City at this point? KM: The City has pegged it's AC34 expenses as an estimated $22.5 million. Do date they have incurred and invoiced us for $8.3 million in planning, preparation and 2012 ACWS hosting expenses. We have paid $6.8 million and will pay the outstanding balance before June 30th of this year. I anticipate we may receive an additional invoice of approximately $1.2 million for the City's remaining 2012-13 expenses, which I hope to be positioned to pay, which will bring our total payment to the City close to $10 million. So we will have covered almost half of the City's expenses to date from 2011/12/13- such as environmental review, planning and permitting for both the ACWS events but also the 34th America's Cup. Effectively July 1, 2013 the city begins a new fiscal year and it is envisioned that the City's event-hosting related expenses will be covered by the tax revenues generated from visitors, the events, the teams, and the associated activity stemming from the AC events this summer. NOTE: The new SF Cruise Ship Terminal at Pier 27-29 will be the site of AC corporate hospitality areas, the AC international media center and a sports bar. The only other permanent structure of the site, the Pier 29 shed, will also be used for corporate hospitality, concessions and activities. Also on site will be a Club 72 for sponsor hospitality and the amphitheater. This past weekend the American Youth Sailing Force team (aka The Force) became the first Red Bull Youth America’s Cup team to capsize an AC45. They’d gone out hoping for a windy training day and got just that, with winds in the high teens and low twenties. Setting up for a gybe set in a mark 1 situation, they began to round the mark and bear-off when they were hit by a gust as the crew came off the rail to gybe. Helmsman Michael Menninger thought heading up would be the safest way out of the situation...but it wasn’t. The boat went over nice and gently, and fortunately there were no injuries or significant damage to the AC45 on loan from Oracle Team USA. The other part of this story, of course, is that there ARE youth teams out on the water sailing AC45s, in large part thanks to a clever concept by Oracle boss Russell Coutts - the Red Bull Youth America’s Cup - to provide a path for sailors 18-24 to a career in the America’s Cup. Here Coutts shares his thoughts on this new youth event. Where do you think the RBYAC go from here? RC: It does have strong support from a lot of different aspects. The more Red Bull have got into this the more enthusiastic they’ve become about it which I think is fantastic. Once they get involved they generally do things really well. It’s proving to be cost effective for them in that they’re getting a good return on it already. More than that, one of their objectives from day 1 was to do something that was widely supported by the sport and it appears that’s the case. As far as what we do with it in the future, that’s what some of us are thinking about now - how to keep this going and how to make it a more organized process it so that it happens regularly. That’s the next stage. Any thought to buying back the AC45s from teams and consolidating them here in the US for an ongoing youth series, stadium style, kind of like the Extreme 40 series, for the US? Seems like that would help consolidate your investment in this particular event and nurture the fan base? RC: I think it needs to be international and I think we replace the AC45s beyond this AC anyway. It’s more a matter of whether the youth boats should be something smaller than an AC45, that’s the question we’re asking. Whatever it is, it needs to be transportable on a container but maybe you could have a slightly smaller boat which would give a less number of crew - perhaps 4 rather than 6, that reduces costs and makes the entry even easier - maybe if you had a slightly smaller boat you could drop the age a bit too because I think while these guys now are sailing in the Youth America’s Cup, they’re going to straight away be good enough to race the bigger boats. You’re probably going to find that future America’s Cup sailors are between 25 and 35 years old. Maybe you need something that fits underneath that. Have you seen any of the American teams out training & what do you think? RC: I’ve seen some of them out on the water and they’re starting to push pretty hard and getting used to sailing them. Right now there’re several of the international teams that are ahead of the US teams but they’re closing the gap rapidly. The main thing is going to be is that the series is the beginning of September and that’s what our focus is on. How do you think it’s changed for young guys wanting to get into the game versus when you were a similar age? RC: This definitely offers a platform and a process whereby the guys can really come in and prove themselves. I gave the US guys a few words before this last session that they did and said that really, this is their chance to show the sailing world and the America’s Cup community in particular that they want to chase to make it and therefore they should be putting 100% effort into making this the best possible time that they could have. Their preparation needs to be as good as they can possibly do because I think this is the best shot that they’re going to get over then next five years. If they make enough progress they could end up as AC crew. It’s a more tailored pathway than the way I did it. If for example one of the US teams won this, for sure they will prove to everyone that they are capable of going into an AC team. Do you see that there’s any room for female sailors in the AC45 game, or do you think the physicality and strength required is too much? RC: There are certain positions on board where physicality is not such a factor like the helm, if there’s a female sailor who is talented enough, there’s absolutely no reason why it couldn’t be happen. If there was a female sailor out there even right now, I’d guarantee to you one of the AC teams would have her on a team. This youth platform will probably give more opportunity to more countries that show their talents. What’s the best advice you can give these young guys going into this event? RC: Maximum effort. This could be a turning point in one of these young sailor’s careers where they all of a sudden get the break that they need because they’ve been able to prove their ability. As I said to them the other weekend, one of the things that’s difficult and hard to adjust to when you come into professional sports is that you are judged on your performance - it’s very black and white, cut throat - there is no gray area between succeeding and not succeeding. If you really want to do this you have to show the various people that you really want to succeed. You’re not going to get hired just because you’ve got a nice personality, you’ve got to show your talent and will to work, your ability to dedicate yourself and train hard. That’s what going to get you into the America’s Cup. 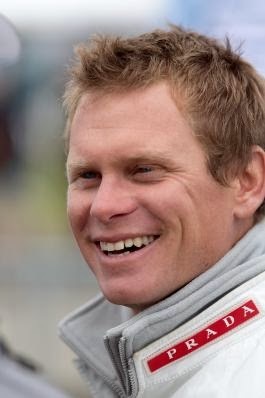 (April 15, 2013) Canadian Curtis Blewett likes to switch gears between America’s Cup campaigns, turning to his other passions to recharge after the intensity of a Cup effort. Between doing bow on Alinghi’s big cat for the 2010 Cup in Valencia and being snapped up by Artemis Racing for AC34, Blewett ditched salt water for his hometown mountains in Whistler, B.C., where he spent time paragliding and skiing with his wife, Monique, and 4-year-old son, Valentino. It wasn’t all wine and roses, however. He snapped his Achilles tendon in a spectacular ski crash, and spent 8 months rehabbing the injury. He says he’s now 100 percent, which is good given all the extra running he’s doing on the AC72. What are the differences working this AC campaign versus your previous one in 2010? CB: There’s a lot of similarities really because with Alinghi in the big cat we were learning as much as we were working. The decisions came pretty fast, and you had to respond really quickly. We’re doing that again here. There were only two teams in the last Cup, and I was lucky to be on one of those teams because I think that’s been an eye opener for a lot of people who didn’t do a big boat last time and haven’t raced since 2007. You have to be able to adapt and learn really quickly in the first generation of a class. We haven’t had such a fresh start since San Diego and the first generation of the Version 5 boats, so there are a lot of challenges. Describe your role at Artemis. CB: I do the bow on the 45s, and the pit, floater, grinder on the big boat—just like on the Alinghi cat. Everybody pretty much grinds on the big boat. The crew side of things is very physical; the gym aspect of it has really stepped up for all the guys. We train a lot harder than we used to, though I don’t know whether that’s the new kind of boat or being 40 rather than 30. I really enjoy it; my role was always pretty physical on the other boats anyway. My overall role with the team is very similar to what I’ve had on all the big teams I’ve worked for—working on the rigging side of things in development, as well as the crewwork and sailing on the boat. I work a lot on just the team, trying to gel the team, making sure everyone’s getting along, and moving that along. What are the similarities if any between the Alinghi catamaran and the 72? CB: I think a lot of things from that boat have ended up on these boats, especially the carbon rigging underbodies and the bowsprit suspended from the wing. The 72s are basically a blend of the wing of USA-17 that won the Cup, and the undercarriage and the general concept of the Alinghi cat. It’s not surprising because those two designs teams have all worked together. Was it surprising that Alinghi opted out this time around? CB: I wasn’t surprised at all; I thought it was a good decision by Ernesto. I hope he comes back. I think that group of people and team was so tight that they were always going to be a threat in any class as a challenger or defender. It was always going to be a powerful team and thus always a good target for hassle, so I think he’d had enough of having the fun taken out of it, and he’s taken a well deserved break after three Cups. Describe the transition from the 45 to the 72. CB: The team we have now had solid big boat experience from the beginning. The sailors who were chosen are all good on the 72. I think it would be easy if you were running just your dream 45 crew to get into issues down the road with not having enough big boat experience. How quickly are you getting up to speed on the 45 with foiling systems? CB: It’s going well, and I’m happy with how quickly we’re learning. It looks tricky to me, but Nathan doesn’t seem to have a problem with it! What areas do you think Artemis need to keep working on to improve? CB: We’ve had some nice days with Oracle; those are really helpful. We learn a lot whenever we line up with those guys. We obviously need to work on the foils. I think for all the teams the reliability is going to be the big issue, sailing the heavy air on the Bay: cold weather, cold water, and really windy. That’s going to be on everyone’s mind once they get their boats sorted out. There’ll be plenty of opportunity to throw your program away with a couple of bad decisions. If it happens to anyone from this point on, it’ll take them out of the competition. How’s the general atmosphere at the team? CB: We are not on the easiest road because we’re working on the foils, but it’s going well otherwise. We have a really strong shore team; they’re as good as any shore team I’ve ever worked with. They really have a lot of depth of character and have probably been the steadiest through this whole thing. They’ve carried the team along, and it all rubs off. The strength of those guys and their commitment has been an example to the rest of the team. Do you think this AC is about the boat, or about the crew? CB: This AC I think is the total package, because it’s the first of the class. It’s much more high performance and the whole thing has been amplified: the crew work, the physicality, the maintenance, the racecourse has changed. There are new things to learn, new rules, and the technology is obviously much trickier. It’s quite something just to get a 72 out on the water. To win, you need a lot of smart people. How do you think the Challenger series will be with just three teams? CB: It’s more than we had in the last Cup. I think it could be pretty exciting. It’s a long duration of racing, but in the end, the America’s Cup is about the Defender. It always comes down to that. It doesn’t seem to matter whether there’s 20 teams or three teams, there’ll be some pretty good sailing on the water from the best groups. There are fewer in the B group, but the A group is still there, and you’re still going to see a heck of a show come September. Compare working in the AC to other sailing programs you do. CB: In the Cup there are more variables, and it’s a longer time so there are more small decisions that you have to make well over a longer period of time to do well. The rules are very open so you can get off track, and it takes a lot of focus and perseverance to stay on the path. But I enjoy that because you’re obviously rewarded for making those decisions. How do you find transitioning from one Cup to the next gig, back to AC, etc.? CB: I find sailing changes particularly fast to be honest, and I’d prefer to focus on the big events and take more time off in between, which allows you to be fresh and fit, everything under control with the family and happy to start the event. You enjoy it and do a better job with a Cup team rather than if you try too hard to do too much other work in between. I really think if you’re going to focus on the America’s Cup, it’s complicated enough that you really need to just stick with that. (March 14, 2013) Luna Rossa is counting down its last days of training and preparation in Auckland, New Zealand, where the team has been steadily making up time as latecomers to the game. In a few weeks the sailing team heads to Naples for the grand finale of the 2012-’13 America’s Cup World Series, while much of the shore team will begin to set up shop in San Francisco. 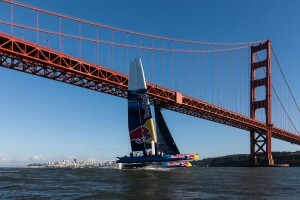 Team manager Max Sirena plans to have his team sailing on San Francisco Bay by the beginning of May. The 41-year old has his work cut out for him managing a relatively novice team, however he says it’s way less stressful than his job managing the wing program on the monster trimaran in his last campaign with Oracle Racing. Luna Rossa has been very quiet lately? MS: This is how we like to work—we don’t like to show too much, we’re not the kind of team who likes to go in the press every week like all the other teams are doing. I prefer to work really low profile and take all the distractions away from the team. We are a young team, we start almost a half year after the other guys so we’ve been really focused on what we are doing, which is really hard. I want to focus on the job. How many training days have you had now? MS: We sailed 26 days inside of January 30, then we sailed after that 14 days, so we have about 40 days on the 72, about 4 or 5 days behind Team New Zealand who is the team with the most sailing days in their pockets. Have you been doing much sailing with ETNZ? MS: We’ve been doing some practice racing with them, and it was really positive because for the first time we’ve seen the two 72s doing a real match race start and what the 72 can do in the pre-starts. It is very different to go around the course in the middle of the ocean with no limitations and especially without any other boat interfering in your course. Every day we are more and more surprised at what you can do with these boats. What’s working and what’s not in the pre-starts? MS: Everything is obviously related to wind speed. As soon as you go in a higher range over 18, everything is more difficult to do because the boat is way more loaded and is powerful. For example, it’s really difficult to do a double tack in a short amount of time, or a double jibe. But so far we are surprised that you can almost do everything, but again it’s all related to the wind speed. Are you prepared for the summer sailing conditions in San Francisco? MS: We’ve been lucky as since January we’ve had a lot of windy days in Auckland, over 16 knots for a big percentage of our sailing days and over 18 for most of the last few sailing days, with a day of 20-25 knots. We have tried to push the limit higher and higher every time we get a chance, but again there is still a lot to learn in the higher wind range so we want to take that carefully. Do you worry about capsizing? MS: The problem with these boats is that they’re really powerful. Over 22 knots it is a completely different way to sail with these boats—you have to pay attention and respect that. When it’s getting really windy, we always make the call and say together, “Let’s respect the better way,” which is the most critical moment when you sail in big breeze with this boat because you always hope that the bow doesn’t stick down. We had a couple of nose-dives the other day, and I can tell you its pretty scary. (April 3, 2013) These days, Russell Coutts spends a lot more time in his office than out on the water. 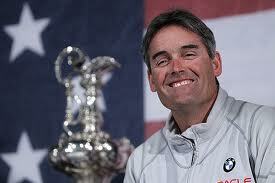 But for the America’s Cup's most successful skipper, it’s all part of the challenge of the game. In fact, he appears to be thriving amidst the barrage of criticism from fans, other teams, and San Francisco politicians. Though, to be fair, many people have been much more positive about the new look of the America’s Cup. He remains confident that once the event starts, the negativity will die down considerably and the racing will command everyone’s attention, just as he hoped it would. Oracle Team USA is on Day 20 on Boat 1 with Wing 2. Boat 2 won't launch until the end of April; what’s the plan to ensure the Defender is ready for the main event in September? RC: We have our two foiling AC45s, which we’re training on, and once we get our two 72s on the water—the boat should launch at the end of April—we plan on sailing and racing those two boats against each other up until the end. So, you’re feeling confident that things are looking good for the team? RC: Yes, I think so far, so good for Oracle Team USA. We recovered well from the capsize, and that seems like a distant memory now. As long as we don’t get a repeat of that, we’ll be in pretty good shape. Rod Davis recently made a comment about the deception that goes on in the AC, but in my experience, that doesn’t really matter a damn. It doesn’t win or lose you the Cup. I just don’t think it’s been a big factor in any America’s Cup I’ve been involved with, it’s the media that make more of it. Whether we did or not [spy] in my opinion wouldn’t affect the outcome one little bit. When I assess our program, not only do we have a very good design team, we also have a very good sailing team, so I think we’re looking good. Oracle and Artemis have not had the opportunity to train together for a variety of reasons. Explain why this is a good or a bad situation for Oracle. RC: Probably bad because it’s always good to work out with another team; the more we can sail with a team like Artemis on a regular basis, it enhances the competitive juices and shows you a different perspective about things. You can learn a lot. 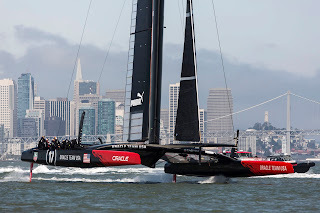 After Artemis had a brief chance to sail alongside Oracle's second AC72, they then decided to add foils to their boat. Can you comment on that chain of events? RC: Things are changing so fast with the technology, and I don’t think any of it is particularly earth shattering in that foils have been around a long time. I think there’s design talent in that team that could analyze the situation pretty quickly. Probably they’ve also got an AC45 that they’re practicing foiling in. They could probably learn a lot just from looking at what some of the other teams have done and factor that into where the future is going, and they may end up just as well off, or even better. The playing field is changing so fast I don’t think it’s necessarily all about sailing time on the water and time with the equipment. It may be more about the choice of the equipment you choose to build and how you apply that to the boat at the end of the day that matters. In 1995 AC Team NZ launched our boats literally just months before the Cup—I think two months before racing began. Some other teams sailed much longer that that; developed boats full size etc. But we chose a better design path, got a better design product, and that was the winning factor. There are plenty of other examples over the years. It’s easy to fall into the trap of saying, “We’re doing more, and therefore it’s going to be better.” I don’t necessarily think that’s the case. I only think you need to have to have the best equipment on race day, nothing else matters. 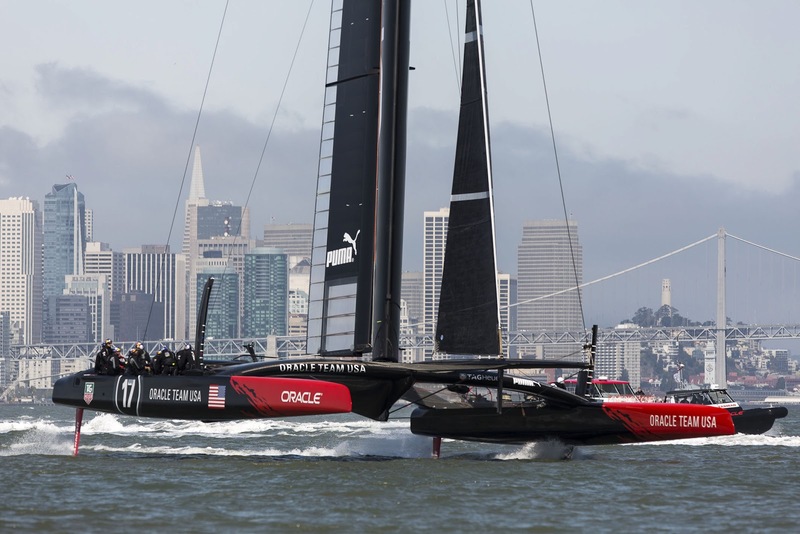 How will the course on San Francisco Bay be adapted to manage AC72 racing? RC: I don’t think there’s going to be much difference, and the sailors will adapt to the shorter confines of the course. Just like any of the boats over any of the AC generations, people start off by saying that they’ll never be able to sail about, that they’ll be so difficult, and so on. After the crews become pretty good at it, they say, “Well, actually we can.” Even the Version 5 boats, racing them inside Auckland Harbor, if you had gone back to the very origins of that class, people thought we couldn’t possibly do that. It may start off being a really tight racetrack for the teams, but after a while they’ll get used to it. What was your favorite World Series venue, and what’s the plan for continuing it beyond this spring? RC: There is a plan to continue and expand the concept, there’s no doubt about it. If Oracle Team USA were fortunate enough to win, there’d be a break while things got reorganized, but the plan would be to continue it for sure. San Francisco was probably the best just because of the wind conditions, etc., but I also thought Newport was good. Frankly, they’re all good—Plymouth was a good venue when you look back. It has been a great series. You have to remember that two years ago—August 2011—this thing started. Before that we had nothing. There have been a lot of situations where you could have done a lot of things better, but that’s good news for the future. We now have a concept that did work, that did create excitement, and that did turn out to be a good television product. I think it’s nicely in a position of refinement now, making sure that costs are well managed, making sure that the television production follows the right process, making sure that the competition itself develops into a meaningful format in that there’s more teams in the game. These things will make the product better in the future. You’ve won the Cup for other countries and seen the national response to sailing in other countries. What do you think are the key differences about the perception and response to sailing in the United States? RC: I don’t think there is that much difference actually in the U.S. Let’s wait and see after this America’s Cup and after the national broadcasting. If you’re comparing the America’s Cup in San Diego to some of the other America’s Cups, it was hard to get interested in San Diego when there was no real event village and the racing was miles out to sea, where no one could see it. You’d have to be an extreme optimist to think that was going to be a great series. Now we have a proper event village, a festival of activities, and racing will be right on shore for people to see it. Just as they started to at the World Series events, Americans are going to think this will be a fun thing to come along and be part of. In Newport, R.I., the town itself almost because an America’s Cup village. Imagine if they had opened up racing inside Newport Harbor what it would have been like. As it was, it was pretty good. Moving it into a major city is another jump again. I say let’s wait and see how Americans respond this time. If you win the Cup, what changes would you foresee? RC: I think the idea of ACRM has been a good one, where you have an entity that manages the competition on behalf of all the competitors. That concept could be expanded more widely to the America’s Cup, where you do things more collectively rather than as one entity. I think you also could, with cooperation from all the teams, do things for a longer term to allow the media and sponsorship partners, etc., to participate for a longer term. For example, all of the competitors who enter next time would agree to keep to a certain format and certain type of boat, certain venues in the World Series, etc., even if they won the next America’s Cup. And instead of extending [a format] to only every four years, you’re up to eight straight away which gives you more scope to develop the product and create more value for the commercial partners and media. A simple example is media rights. A lot of the big media players would probably find this much more valuable if they could sign up for longer term rights. If you know your entries and you know one of them is going to win the next America’s Cup and they agree to take over those rights should they win, then all of a sudden you can give those media companies what they want. It would make a big difference, for example, if we knew that after this event, NBC would be carrying on for the next one as well. These are the sort of things that could be expanded in the future. Do you miss being on the boat? RC: Some days, but other days not. The America’s Cup is an incredibly challenging world. There are lots of things going on, and that’s the great thing about it. I certainly love my time sailing, but I also like the complexities and challenges involved elsewhere as well. It’s fun at all levels. March 6, 2013 - Behind the scenes at Oracle Team USA, Joseph Ozanne crunches numbers using mind-numbing equations all in the name of a faster time around the racecourse for his team’s AC72. Ozanne is the team’s wing design leader and is also responsible for the performance prediction functions. Much of his work in the current campaign involves the daggerboards, which he believes will be critical to a team’s success in the 34th America’s Cup. Now on his third campaign with Oracle, the 34-year old Frenchman has had plenty of experience working with the best in the game. What’s been the biggest change for you over the last three campaigns that you’ve worked with Oracle? JO: As a designer, the biggest change from what I was working on in 2007 is that back then we were dealing with the unit of speed as a meter per minute. We considered that if a boat was gaining 3 meters per minute [compared to a training partner, for example], it was super quick. It’s much more exciting for us now because we are dealing with massive boat speeds and speed differences. Instead of 3 meters per minute, we are talking about 40, 50, or 80 meters per minute. These are massive differences because there is a lot to gain. Did you bring much from the last campaign, with the 90-foot trimaran, to the current campaign? JO: Same as with the ORMA [the French offshore multihull circuit that spawned so much innovation from 1996 through 2007]. We spent a lot of time on the big trimaran and studied things a lot more carefully than in the past, so we have a lot of knowledge on the multihulls. Since the 33rd America’s Cup, I think multihull design has taken a new step forward. There’s much more work involved, and for us, we had done the wing sail before, so we knew where to go with that. Is the wing more important that the foils on the 72s? JO: No. You need to consider that the foils are now the main driver of performance on these boats. It’s critical to have it right. Last Cup I was a wing designer, and then everybody believed that the wing was the key but that’s not true. The reality is that on this boat, the multihull, we try to minimize the drag. That’s the goal overall. Where you can really make big gains is under the water, and you really need to have it correct. The foils and the windage are two areas where you have to focus because boats are going 40 knots, and the faster you go [the more] you’re going to create drag. The most efficient way to do that is to lift the boat to reduce the volume of the floats, so you need to lift your boat out of the water. You can do that with foils, but you can’t do that with the wing because it is vertical. You trained with Juan Kouyoumdjian. Are you surprised Artemis Racing [where Kouyoumdjian is the lead designer] didn’t adopt foils earlier? JO: First it’s a multihull, and these guys have never designed a multihull before; it’s a quite different exercise. What I understand from them is that they didn’t evaluate the value of lifting your boat; it’s not whether you are flying or not, it’s the gain of reducing the amount of volume you’ve got under the water. There are some key areas where you can gain performance, and you need to identify these areas and focus on those. It’s surprising to do this change now, but you have to do it. It’s good that they’ve realized that and can change now, rather than in July. These are super complex boats. There are a lot of parameters involved, and it’s really a complex equation. I believe that if you are not that familiar with multihulls, it’s not easy to get it right the first time. It’s been suggested that summer conditions on San Francisco Bay may not be conducive to foiling—fast boats, short courses, big breeze, significant current. What do you think? JO: As always when you design a boat, compromise is wind-related: light versus strong, etc. The aim is not to “fly” at any price; our goal is to reduce the drag on the boat. For particular conditions and a particular moment of the race, it’s going to be a consequence to foil because we try to reduce the drag and foiling is the consequence of this particular design package. In some conditions the best set-up is to fly, but if you end up with the wrong angle and you go too high or too deep, it’s not adapted to the race. You may be fast but you need to be fast in the correct direction. Perhaps with Artemis, the call was that it was never going to be efficient. If you look at the boats right now, ETNZ is going to be very good in very strong winds, Artemis will be good in light air. The problem is we really never know what the wind is going to be for racing. What’s the best scenario for the foils to work optimally? JO: There are two parameters: the wind strength, and if you are upwind, downwind, or reaching. There’s an optimum shape depending on the conditions, and when you want to lift your boat out of the water you need to have a certain boat speed to do it, so you need to have enough wind to reach these boat speeds. You’re going to reach these boat speeds mostly downwind or reaching, so I don’t see there’ll be any boats flying upwind because you don’t go fast enough. How many sets of foils are you allowed? JO: The Protocol allows us to build 10 boards maximum. As usual in the design world, you can get good boards for light air, good boards for flying, good ones for upwind, good ones for downwind, etc. There are multiple combinations. In a perfect world, if you know the conditions in advance, you can choose the best set for your race. In reality, it is a matter of range: which set gives you the wider range regarding the conditions that you will very likely get during the race. Each team will probably end up with one or two good sets and will choose few days in advance which one is the best for the coming races. How have you observed the transition to the focus on foils? JO: I’ve been working on multihulls for a long time, even before the Cup. I’ve been working on the ORMA 60 and have done a lot of work since 2001 with Michel Kermarec, who is the main foil designer here at Oracle. Foils have always been a big focus. Using the sails as an example, the sailors have always been very involved in the sail design as many used to be sail designers and sail trimmers so there is a strong connection. But, on the hydro part of it—the foils—because the sailors don’t see the foils, they have less implication. That’s started to change because everybody understands the importance of this design, so there’s more interaction. We’ve seen it on the dinghies, the catamarans, the Moth; there’s a strong focus on the foil because there’s a lot to gain here. We need to see that as a big driver; what you do with your sails, you do the same underwater. It’s an equivalent amount of work that you need to do in the package. How have you trained the sailors to use the foils? JO: We give them targets, for example, when they go sailing, we say in this condition you need to have this angle, trim it this way. We give them some numbers to start with, which they usually follow, then they will come back to us with feedback. We have a constant communication with the crew on this. It’s very important, and we don’t always speak the same language. As soon as you put an equation or formula on the table you just lose your audience, so you need to find a way to talk to them. You need to convince them that your design is correct and explain to them that this is the design and how you can trim it. It’s kind of like a user guide that we give them. It’s complex because you have a lot of parameters to play with. What’s your impression of the 72? JO: They’re amazing boats and very impressive machines. They are much more powerful than the ORMA 60s, for example. The development is much more refined, much more accurate. JO: It’s busy in phases mostly. You’re super busy when you need to finalize the boat, the shapes. In my case it’s the shapes. I do performance predictions; you’re constantly using them as tools to predict performance when we need to design a new shape, so it’s kind of busy right now. I’m not personally involved with the prediction itself, but when the boat is sailing it’s very busy because you collect data so that you can validate the assumptions you did months before when you were designing the shape. There is a lot of value when the boat is sailing because you’re getting feedback from the sailors, and it’ll be like this until the end. When you see something happening on the water we need to be able to explain it: why it's faster, why it's slower, why you need “this” set up, so we are very busy with that. Who drives the decision to design a new shape? JO: Michel K is responsible for the new shapes, but it’s actually very simple: We have a certain amount of money for the campaign; we have a deadline, Sept. 13. With the budget we decide we’re going to build X boats, so we’ve got a deadline for the boat and the shapes--that’s how it essentially works. You will give your shape with your base knowledge at this stage. Obviously we have much more knowledge at this point than we did a year ago with the first boat. You’re constantly processing new information. Boat 2 won’t be out of the shed until April; do you feel like you’re behind schedule? JO: Not really. We had a tough time with the capsize, but I think we took a lot of positive from that, and I think we are stronger now than we were because we know the limits, and we know what happened and were able to react. I’m happy with where we are now. I’m very confident that we have the correct boat. (February 20, 2013) It’s hard to keep a good man down, especially the ebullient Iain Percy. The 36-year old Brit has moved on from a disappointing outcome at the recent Summer Olympics—losing the gold medal in the final race—and is now applying the same zest that won him gold at the Sydney Olympics in 2000 in the Finn class and again at Beijing in 2008 in the Star class to his role as Sailing Director for Artemis Racing, where he’s finally finding his groove in the Cup arena after his experiences with the very underfunded +39 Challenge in 2007 and Team Origin, which was formed to compete for the 33rd America’s Cup but then locked out by the Deed of Gift match between Alinghi and BWM Oracle Racing. Sailing World: Was the medal race in Weymouth something you agonized over after the dust settled? Iain Percy: I did have a few sleepless nights over it. It was obviously a very tough day for Andrew and I. It was actually a real bonus to have some racing to turn my attention to because I was really frustrated with the nature of the way that it happened and losing the gold. To be able to really throw your energy into something that’s huge and exciting very quickly drags your attention away from being down about everything. SW: Will you do another Olympic campaign? IP: I won't unless the Star is back in. I think at the moment my tired body would refuse to get back in a Finn so there’s not much chance of that. The Olympics are trying to make it for under-80-kilo (176 pounds) guys in every class so unfortunately that excludes me, even moreso since I’ve been living in America! SW: How did you manage the stress of an Olympic campaign & your commitment to Artemis? IP: I don’t get particularly stressed by it all; I enjoyed both aspects a hell of a lot. Obviously when you’re lining up on the start on either the AC45s or starting the first race at the Games, no one’s immune to feeling nervous, but you enjoy that and that’s what you thrive off, going out racing is the reason we’re all sailors. I actually had a really fun year. I really enjoyed the Star with Andrew even if the result didn’t quite work out in the end. It was a busy year for sure and one of the motivations maybe for not looking anywhere near Brazil is that I’ve learned the hard way over the last six years that having two jobs is difficult. SW: What similarities do you see between an Olympic & an AC campaign? IP: I think the primary one is that they’re both focused around one event that is everything at the end. It’s so different to other sports or other parts of sailing where you have a circuit for the year. That’s a very important similarity because it’s to do with campaigning and working up to something rather than targets along the way. It’s a very different way of training and preparing yourself both mentally and physically, which I’m used to and have done for a long time in the America’s Cup as well as the Olympics. But at the end of the day they’re both about a sailing race and my job as tactician has many crossovers with my job as tactician in the Star: negotiating the start, interpreting the wind, and making strategic decisions. There’s also the team work aspect. Olympic sailing has grown over the years and even in our Star team there were about six people involved, albeit not all full-time, but working in that group and getting on with the guys is a big part of it. SW: What do you bring to the Cup arena? IP: I still have an Olympic ethos—that focus—I want to win pretty badly when I’m doing something. Sailing for me has never been a job, it’s always been a passion. Artemis is lucky to have a whole team across all the nationalities who share that, and I think people feel that passion from me as well. We’re very focused on that end goal. SW: How is this Cup campaign different? IP: It’s unique in a lot of ways. In terms of scale of operation, engineering, design, building, it’s an incredible departure. Anyone who knows anything about our sport comes to a team base and sees the operation is flabbergasted. No matter how big you think previous Cups have been this is a massive scale bigger. Everything is new, every part is engineered as a one-off, we have no experience in designing or building boats like this. It just takes a lot of energy and a lot of time from all departments to pull that together. SW: What do you do in your role as Sailing Director? IP: My job in a few months time is to get out there and race as well as we can. There’re many parts to that. There’s the racing element and then there’s using the equipment. We’ve had to get our scheduling in line with the other departments like the build and the design as obviously we can’t go out sailing when the boat needs some improvements, so between myself and the other areas in the team, we hash out the best plan together to get the boat out sailing. SW: Was it awkward moving into Terry’s role? IP: There were never any awkward moments. Terry was fantastic for the team and got us into such a strong position. He’s made my job very easy. The guys are all very motivated under Terry and they still are. It was a difficult situation for all of us personally, but I think it was the right move for the team. We’ve got some very talented helmsmen with high performance multihull experience—like Loïck Peyron—who are serving the team very well. It’s working out fantastically, but at the same time we’re very grateful to Terry for setting up such a great structure and environment here at Artemis Racing. SW: What do you see as Artemis’ strengths? IP: I feel we are incredibly strong in the helming department—to see Loïck and Nathan working together, bringing the experience and that young enthusiasm and talent together, is awesome to watch. Across the whole boat we have so much experience, with some people coming from either big ORMA French cats and also from the Alinghi project; so we have a lot of experience getting big boats around the course, and there’s going to be a ton of that in this racing. I think as a sailing team we’re really positioned, and I’m proud to be a member of the group we have. SW: Are you happy with your performance on the 72 so far? IP: We were out yesterday and thrashed the boat pretty hard at race pace for the last hour or so and we got the boat around the course really well—that’s started to be a real strength for us. Like with any development boat, the improvement in performance is really rewarding because it’s so fast. We’re really well led by Santiago Lange who coordinates between the sailing and design teams. Under his leadership we’ve been able to make huge jumps in performance in a really positive environment. SW: Are you enjoying sailing on the 72? IP: It’s a cool boat to sail, there’s no doubt about that. [One of the first days sailing] we carried on just a bit too long because we were enjoying it so much. We were screaming across the Bay going near 40 knots and thinking we might stay out for another half an hour and got a few looks when we came in when it was dark. They are super quick, super powerful, and take a lot of skill to get them around the course so its rewarding as well. (Feb 1, 2013) Philippe Presti (FRA) is a well-preserved secret in Oracle Team USA’s arsenal of racing weaponry. He’s one of those extremely quiet unassuming types that it pays to watch out for, one who sits back quietly observing the lay of the land, or the race course as the case may be, biding his time patiently for the right play, characteristics that have served him well as coach for the Defender. A sailor at heart, Presti takes his coaching role seriously and modestly claims that he is only as good a coach as he is a sailor - as two-time Finn world champion, that claim goes a long way. Presti was coach and tune-up helmsman to Jimmy Spithill on Luna Rossa (ITA) for the 32nd America’s Cup in 2007, and coached BMW ORACLE Racing prior to the 33rd Cup. How did you come to coach Oracle in the 33rd Cup? PP: I met Jimmy (Spithill) a long time ago when I was preparing for the 2000 Olympic Games in Sydney. I was at a very good level, second in the world in the Finn. We had this young kid coming for these training camps in the morning before school - 5:30 to 8:00 - Jimmy would show up and so we started to form a relationship. Then, I was driving the B boat for Luna Rossa in the 2007 AC campaign and he was driving the A boat and I started to coach him a bit - we would share things and I began to help him in the afterguard - I tried a little more discipline and to help him build the plays. Obviously Jimmy liked that and he asked me to come back for the 33rd America’s Cup quite late in the game. I did a couple of interventions during that campaign then joined the team at the end when the purpose was to go racing. We’d work on the plays and on the simulator. We had a “camp” on the two Extreme 40s - I’m a match racer so the big question was, how are we going to match race these cats? We started with A Cats then scaled up, and when we couldn’t race against another boat we would work with simulators. How has this campaign with Oracle Team USA been different? PP: The boats - we started sailing a monohull in the very beginning for a while after the big trimaran as we wanted to catch up with the Louis Vuitton Series - we did a lot of training on the RC 44 and the version 5 boats until we swapped to the AC45. We initially trained on that in NZ and meanwhile we had three A Cats so we were working with this multi hull platform and tried to match race these boats and learn from them. That was different. What are the biggest challenges coaching the team? What do you think the team needs to improve on? PP: There’re a lot of areas we can improve. We haven’t sailed the boat enough - only 8 days - so putting some hours on the big boats today would be the highest priority. At the moment I’m trying to think about how to improve time and distance skills. We are in a really challenging situation so if we’re not trying to push all the areas together we wont succeed. How has Jimmy changed in the past 10 years since you’ve been working with him? PP: He was pretty young so he’s changed a lot in the way he approaches life. He’s married with kids now. When he was younger he was more interested in just the sailing part of the equation, he was very into the technical and tactical side and now he has a more open vision because he’s running the team. Did his talent stand out to you when you first started working with him? PP: He’s extremely calm and that creates something with people around him - a trust. In the AC 32, relationship with people was very important and he had to maneuver the version 5 boat so full trust, was important. He doesn’t blow you up, he’s trusting you so you give him the most you’ve got. That’s the feeling I’ve had talking to the crew and sailing with him. He’s been strong under pressure, he shows good stability which is important when you have this kind of business to run. He’s really at good match racing as he’s got the fighting instinct. He’s extremely aggressive in a good way. He’s also able to listen and to accept thinking that we can do things another way - he wants to learn. A lot of top sailors are in their bubble and they don’t really want to change. Jimmy’s pretty open in that way. That’s a good position for a coach because you feel that the input you are giving is being well taken. Are you focused on the overall group dynamic in your approach to coaching? PP: Not totally. I think everybody can learn at any stage. Mostly I’m a sailor, not a coach and while I’m not on the boat I can speak the same language because I’ve got the same feeling. I’m coaching Ben Ainslie - I’m a Finn sailor and have been world champion twice - when I’m talking with him, we’re talking the same language. When he’s on the water I have the same feeling just as if I was driving. So when I communicate a message I can be technical but my goal is instead of telling them what to do, I try to do it by using media - video or audio or tracks - that can help the person realize what he has to do. Then it’s job done. You show a clip of good footage of what you feel needs to be changed and if you’re doing your job well, the sailor will look at that and say, “I need to do that,” and you don’t have to tell him. That’s the only way to get there in my mind. These guys are extremely high level and they have to be convinced that they have to do it. Audio is really useful too. I’ve been recording communications on the boat - sometimes you take a misunderstanding or decisions the wrong way on the boat so by listening to what was said you can hear the feel the emotion which you can’t see in the video but listening to it, it goes deep, plus it’s clear, there’s no discussion. Then people can improve based on real fact. Even though I know what I want to change, I’d rather show them how. What is going to make a winning Cup team this year? PP: Got to be quick, as usual! You’re not going to win if you’re not quick. That’s been the case for 150+ years. The quickest boat wins. The boat is the same as the team. If you’ve got a good boat you’ve got a strong team because all the sailors are not only the users, they’re also the designers, they put their input into the boat. That’s why we’ve got this strong team, because we have sailors who know what is going to be the next step, what they need to do to save weight, or to improve the systems or make a better maneuver, or how to manipulate the boards -whatever. The team makes the development of the boat so the two go together. PP: I’m still sailing, just not on this program. I am not on the boat everyday but I drive the 45 a lot during the campaign. I have an A-Cat waiting in the shed for me to race next weekend and when I finish this I’ll be running a big boat program - I’ve been tactician and driver for years. Being a coach you need to continue to improve, you need to challenge yourself, I’d rather be a sailor but not on the boat - that’s not the right place. But I used to be in their position so I think I can help them a lot not being on the boat. I used to deal with their problems so I know how to deal with their needs, I can feel them. When you’re under pressure you have a narrow vision of things - you have your goal while all around you there are plenty of other things happening. Sometimes someone who knows how it feels can offer up a different perspective and you can move forward again another step. That’s my position and I try to play that game. Do you enjoy the multihulls? PP: Yeah, I do. I think it is a lot of fun. It’s a new challenge, it’s different, it’s quick and the way with the boundary system and the way we are starting is different. Technically it’s challenging. Thoughts on fleet racing versus match racing? PP: The fleet racing starts are different and but as soon as you’re around the top mark and you do the first jibe, then it’s more or less the same type of racing. Match racing with these boats you see distance between the boats pretty quickly. It’s hard to cover so in that sense, fleet and match are pretty similar. Normally in match racing in the old days as soon as you’re in front that was the game but with these boats if you just cover it’s going to be hard for you. When we did training for the last regatta I decided to train for just the start - we did a lot of starts. Then when the other teams arrived, we decided just to sail fleet because on the course side you learn more the field and every time you have a situation with another boat it’s the same as in match racing - you have to deal with that situation. At the end of the day you cannot really control one boat so you need to learn all the course plays … for me you can use the fleet racing to improve your match skills especially on the race track. PP: I like it when we go racing. We prepare well our plays, we know exactly what we want to do against the other opponent, we know we’ve prepared ourselves for the course, we have the strategy down…we’re polished. Then you go into the race, there’s the five minute gun and then you’re a spectator again. That’s perfect, I like that part of it because I can see what where we’ve improved and what needs to be our next step.